Yesterday was a busy morning. I got up at 5:00 and prepared the whole Motivational Monday post by 7:15. Usually I get the kids up at 7:00, so it was a little hectic getting them ready a little late, but it ended up working out well. My mom came over to take the kids to the bus stop so that I could get a head start on my run. I ran five miles at an easy pace. The past few runs, I've gone a different route, one that takes me down by the lake. Even though it's late-March, the lake is still pretty frozen, and there are HUGE piles of ice on the lake. This has happened in front of my parents' house before, and it's so pretty! The water just keeps piling up and freezing, forming these enormous piles. I tried to get a picture on my run, but unless I went into someone's yard, I couldn't get very close. It seems I deleted my pictures from my run--bummer!--so I had to steal this collage from my Instagram. This was from my long run on Sunday. 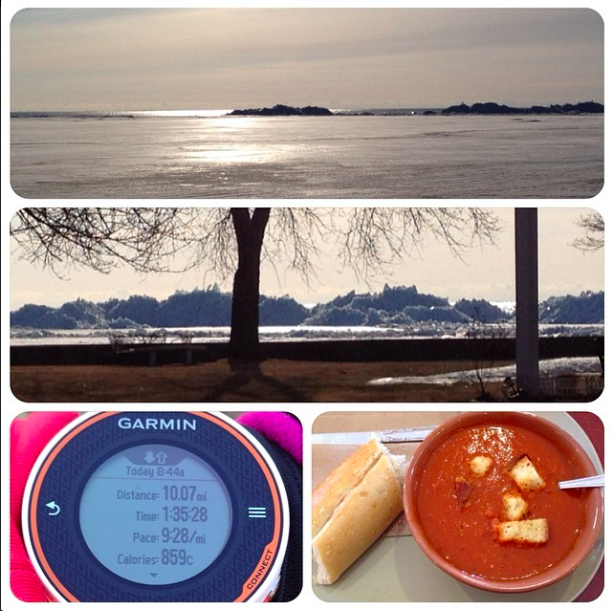 I ran 10 freezing cold miles, and then warmed up with Panera's tomato soup. Anyway, yesterday, I wore my Garmin but I set it to display just the time of day, because I didn't want to get discouraged by my pace that seems to be getting slower by the minute. 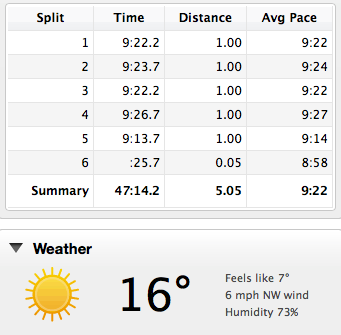 When I checked out my splits later, I was a little amazed to see how consistent they were. After my run, I had a quick breakfast and shower, then went to pick up my mom so we could go visit Mark. When I got there, my dad decided to go, too, and we waited a little bit for him to get ready. Then he ended up driving, which I was glad for later. We had to drive down Gratiot Ave. in Detroit. I don't go to/through Detroit much, but I saw the really bad parts of the city on our drive yesterday. It was kind of interesting to see, though. Mark's nephew's house is just outside of Detroit. After the drive yesterday, I don't think I'd really feel comfortable driving there by myself--which is unfortunate, because I won't be able to visit Mark as often as I'd like. Anyway, Mark was in his wheelchair in front of the TV in the living room when we got there. He was awake and tried to get up when he heard us come in. So it was good to see that he seems to be doing better (physically) since the last time I saw him! You could tell he wanted to chat with us, but it's hard for him to form his thoughts into words, which I think is because of the cancer in his brain. Mark doesn't really like to watch TV, so I felt kind of bad that he was sitting there. I would have loved to bundle him up and take him outside in his wheelchair for a walk, but when Mark asked to go outside, they told him it was too cold. Mark's physical needs are being well taken care of, though, so I'm grateful for that. I was sitting on the couch right next to his wheelchair, and several times while we were there, he reached out his arm to hug me. He even told me while he hugged me, "I miss you. I miss you a lot." That was the only time that I really couldn't help but cry. There is just so much that I want to do for him, but can't. When it was time to go, we took Mark into his bedroom and got him comfortable in his bed for a nap. I gave him another hug, and told him I'd see him soon. I wish that the visit made me feel better, but I felt worse after leaving. I do plan to go back, though, for Mark. Jerry is off work today, and I am SO excited! I know that sounds kind of ridiculous to get so excited over, but over the past three months, he's only had (I think) three days off work. He's finally going back to his regular schedule, and I couldn't be more relieved. It's been really hard doing everything without him--taking care of the kids, doing stuff around the house, dealing with all that's happening with Mark. Today, after we get the kids off to school, we're going to run a few errands, then go to lunch, and then to a movie. There are two movies I want to see right now: Divergent and God's Not Dead. I'm not sure which one we'll see yet. Our movie theater just got new seats--recliners, La-Z-Boy-style. I'm excited to try them out. But mostly, I'm excited to spend some quality time with Jerry today! Don't recall the 2nd movie and I kind of want to see Divergent, but I think I really want to read the books, instead! Have fun! I love the lake pictures. Just awesome! Is there a way for you to take the freeway through Detroit? Even if it takes you a little out of your way? I find it easier to travel through the rougher parts if I'm on the freeway. Enjoy your day off with Jerry! I've heard good things about Divergent. It is NOT ridiculous to be excited to spend time with your husband!!! I would go crazy if I never saw mine, and now I'm curious what your husband does that he gets so little time off?!? We saw Divergent over the weekend and enjoyed it. I personally thought the book was better (of course), but my husband didn't read the book and he still liked it. I hope you guys have a wonderful day together! Your blog was recommended by some on my WW board (100+ pounds to lose) - Canada and I just love it! I have loved getting to know you, your family, cats & Mark. You are priviledged to have someone like Mark in your life. People like him are put in our lives to remind us what is important. I am a runner, but not as dedicated as I should be. I have a 5K coming up at the end of April and my first 10K is at the end of October. Your blog inspires me and I love your honesty! I found your blog yesterday after reading about you in Runner's World. I LOVE what you are doing, and find you very inspiring. What a great day to start reading - all those Monday success stories. I am older than you (46) and have almost the same amount of weight to lose, as you have already lost. I am hoping to follow along with your posts as one more way to stay motivated and focused. Thank you for taking the time to write all of this down and share it with us! Enjoy your "Jerry" time! Both those movies sound really good to me too. Have you read the Divergent series? I looked them up on Amazon.com yesterday, but decided that first I need to read the dozens of books already piled up on my shelf, before buying more. Sometimes I like to read the books first, but sometimes that can ruin a movie too. Your time as a single parent (basically) the last several months, reminds me of my own situation. I think ahead to the day when I will have to do everything myself, after I lose Du, and I really don't know how I will continue to function? He does so much for me, for us, for everybody. It really scares me. Be grateful that Jerry is back now to his regular schedule, and you get to have him with you for many many years! I have been following your blog for a while now. I found it when I lost 35 pounds last year. I'm not a runner, but have enjoyed following your story. My heart is especially going out to you right now as you are going through this trial with Mark. I am praying for you. I would recommend you go to the movie "God's Not Dead" as I have heard some great reviews and it might give you encouragement as to the situation with Mark. I recently have been going through a health situation with my husband, and the encouragement I have experienced was in knowing my Lord & Savior and all of the people praying for us. *sniff, sniff* Hard...to *sniff, sniff* read about Mark....*sniff, sniff* I can't imagine how hard it *sniff, sniff* must be to write about. *wiping away tears* Just remember, even when he's "gone," he will be your angel in Heaven. Watch for signs of him, I know he'll be there for you forever.